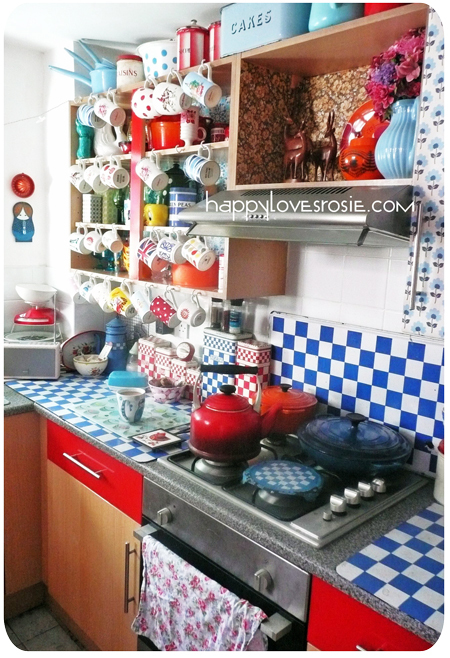 Well lookee here my friends….We have revamped our kitchen…yep we have taken some of the doors off the cabinets and covered some with retro wallpaper….Also we have used red shiny sticky backed plastic to cover the drawers with…don’t it look great! 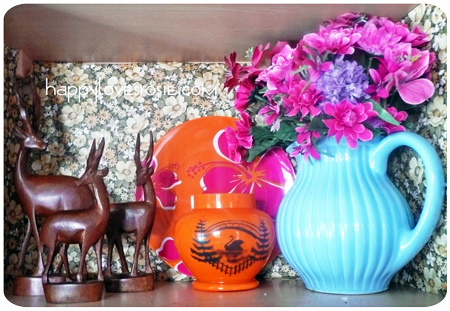 We have also started collecting Happy Kitsch bits BIG TIME and have incorporated this look into most of the house….look below to see what I mean. Of course we will never run tired of the ‘Happy Shabby’ look, but it is nice to be able to mix the two styles and make them gel. we have kept the enamel…I dont think I could ever get rid of that, but we have got rid of plain glasses and have started to collect coloured ones…I don’t know why! but drinks always taste better in pretty coloured glass. A long time ago now we put this shelf unit (below) on top of the work top so that we could have extra space to keep our bowls tidy…we have added to this in the past and it still looks great….you never know though! next time you see it! It might be covered in wallpaper! lol! We have left the fridge (below) as it is…all scrapbooked up and still looking divine! We have even added useful objects to the walls to brighten up plain spaces. …and we just couldn’t resist adding this beautiful stained glass window, to the windowsill…what do you think? I totally love your kitchen! I agree about drinks always tasting better from brightly colored glasses. 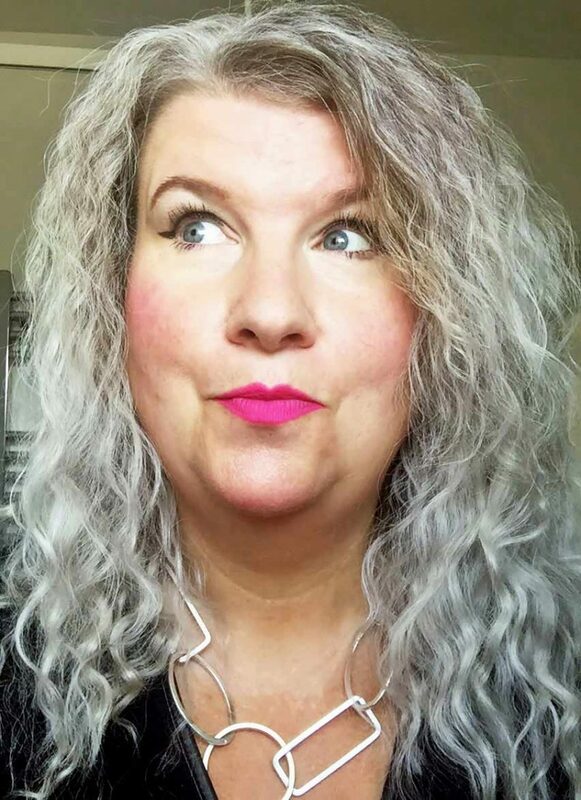 Hello,I've been reading your blog for a while now and like seeing your changes of style. 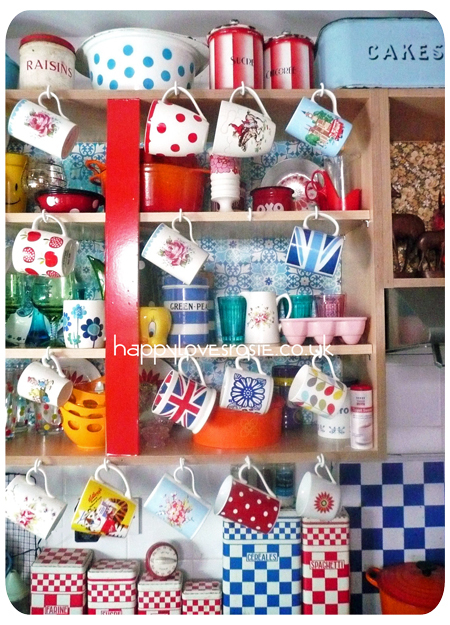 Your kitchen looks fab! Must make cooking and cleaning up much more fun! I think we must be sisters from another life! Love your blog and your colors! o.k. so this is TOTALLY cool……. Love love love it!! Wow! your kitchen is amazing. I love all your vintage mugs and cups. So, So HAPPY! Thanks for always giving me inspiration!! absolutely gorgeous!! x It's so bright and fun. 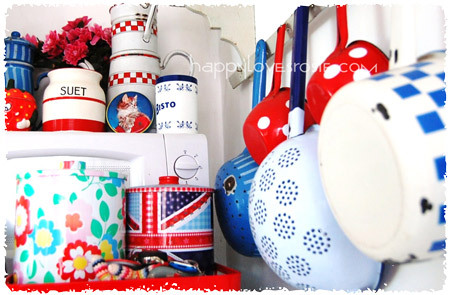 I love all the French check enamel ware. So jealous! Fabulous, and frankly, very very happy! Just as I started following your blog you disappeared – glad it wasn't my effect;)Am loving the comeback of sticky-back plastic – when I was a kid people *did* wood-effect kitchens, and well, they just looked dodgy. But love this bright red – I've done stair risers, and just doing the top of a sideboard revamp in the stuff. All your things look amazing displayed together. I would make me happy just to go in the kitchen everyday. Love it! how lovely! really cheerful, colorful, and sweet!